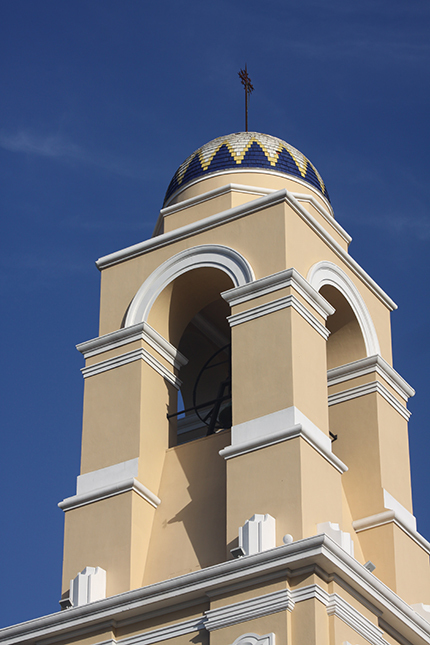 Current view of St. Mary Cathedral, built in a Spanish style, with its single tower housing the bell, and the cupola. The front of the Cathedral of St. Mary. MIAMI | Suzie Pierre developed a passion for liturgy at St. Mary Cathedral 30 years ago, after she arrived from her native Haiti. At 16, she was already in charge of preparing the liturgy for the Mass in Creole. She was also a member of the choir, the youth ministry, and served as an extraordinary minister of Holy Communion – one of the youngest, at the time, in the entire Archdiocese of Miami. “And I’m still doing it,” said the cathedral’s Creole lector, a job she is known for because of her participation in numerous archdiocesan multilingual celebrations. Pierre, who also teaches at St. Mary Cathedral School, recalled that the first time she visited the cathedral she was fascinated by the way Mass was celebrated, especially the organ accompaniment, but also the diversity of the people. 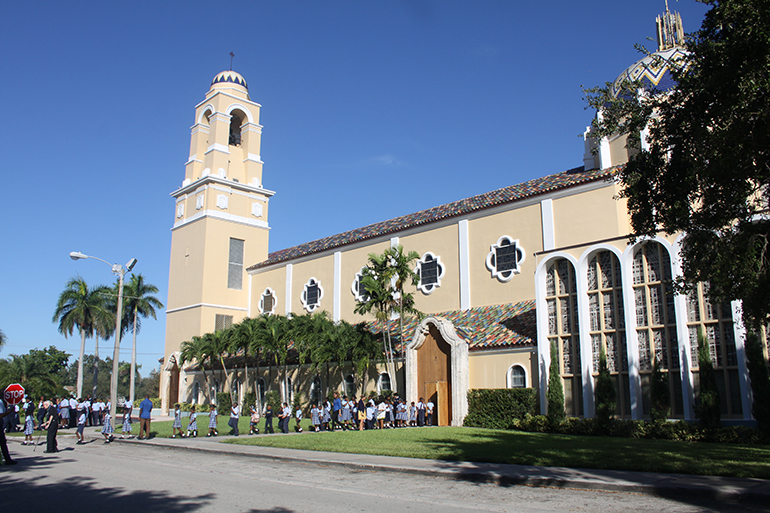 Linguistic and cultural diversity, along with the music and traditions of South Florida’s faithful, have been reflected at the cathedral during the six decades of the Archdiocese of Miami. The cathedral has witnessed numerous ordinations of priests and deacons, the installation of bishops, and an endless number of weddings and baptisms. As the mother church of the archdiocese, St. Mary Cathedral welcomed Pope John Paul II in September 1987. It also officially greeted the third millennium in 2000. For at least three decades now it has hosted trilingual celebrations – English, Spanish and Creole – for a variety of groups and lay movements, along with the annual celebrations of religious life. When St. Mary was founded as a parish in 1930, the neighborhood was predominantly white and Anglo. In the 1960s, the community became white and African American. In the 1970s, with the arrival of the Cuban exiles, it started to transform into a Hispanic community. By the 1980s, most parishioners were Haitian. At the end of the 1990s and beginning of the 2000s, due to the development of Midtown (south of the cathedral), more Hispanics moved into the area. Today, the population of the neighborhood is a mixture of Haitians, Hispanics, African Americans and Anglos. “Among the Hispanics, the majority who attend Mass in Spanish are Dominicans, followed by Salvadorans, Guatemalans and Hondurans,” said Father Christopher Marino, rector of the cathedral since 2012. 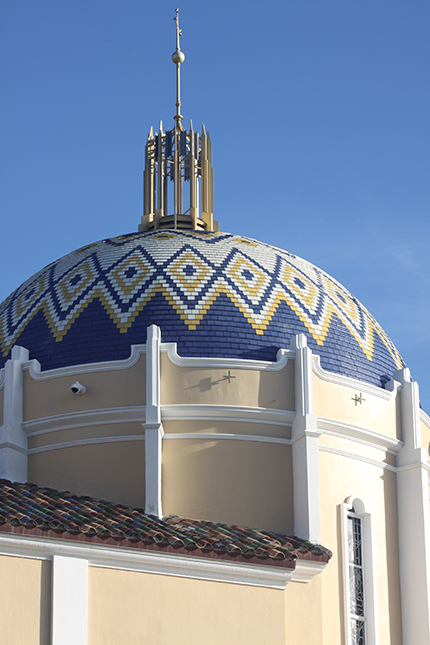 The cupola of St. Mary Cathedral. Bell tower of St. Mary Cathedral. He said the greatest changes to the Little River area, where the cathedral is located, have occurred recently. For years, the cathedral and its school were the only beautiful places in the neighborhood. In the last few years “there have been physical improvements in the area,” Father Marino said. The renewal, which began a few years ago in the areas of Wynwood, Midtown, and the Design District north of Miami’s downtown, is now reaching the cathedral area. “Which is a good thing because things are improving, but there is the possibility that rent will become more expensive,” Father Marino said. He added that although he desires neighborhood improvements, he worries that will eliminate affordable housing for the low-income families who attend the church and send their children to the school. In addition to the changes in the neighborhood, the cathedral church itself has undergone various renovations. The original 1930s church was torn down and a new building consecrated in 1957. 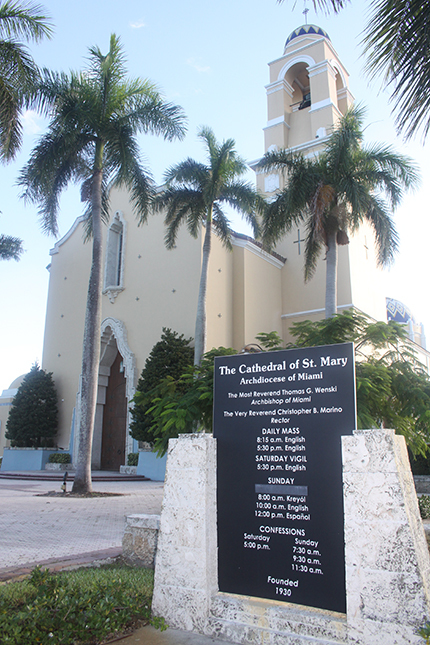 A year later, the Diocese of Miami was created and St. Mary was designated the cathedral. Its new status was accompanied by several renovations. In the 1960s, a bronze bell, weighing over two tons, was added to the sole church tower, along with an organ and cathedra, or bishop’s chair. Italian marble was added in the sanctuary area, as well as an 11-foot tall glass mosaic that extends the length of the arched wall behind the main altar. Representing different scenes from the life of the Virgin Mary, patroness of the cathedral, the mosaic was created by the French artist Gabriel Loire. Also completed at that time was the concrete dome, covered with glazed tiles, and the side chapels of the Holy Family and the Blessed Sacrament — the latter being the first place St. John Paul II visited and prayed at when he arrived at the cathedral. The chapel is decorated with a tapestry depicting the encounter at Emmaus, when Jesus broke bread with his disciples. It was created in Bruges, Belgium. The stained glass in the chapel, considered modern art and also created by Loire, represents the Annunciation. The chapel of the Holy Family is adorned with another work of art, The Mystic Wedding by Biancini, who also created the ceramic Stations of the Cross which hang throughout the church. The stained glass windows located in the upper part of the sanctuary were created by an artist from Pittsburgh and brought to Florida. There is also the Rose Window located above the organ, at the rear of the church. In 2000, the sanctuary was expanded and a new parish center was added, with a courtyard that connects the offices and living quarters. “We needed space to gather outside,” said Msgr. Hogan. The cathedral’s original, enormous, mahogany doors, beset by humidity and termites, are currently under restoration. “Some of them don’t close and some are breaking,” said Father Marino. The restoration is expected to be completed in 2019. In the school, hurricane-impact windows and doors have been installed, and glass doors have been added to the interior, as well as the parish hall and the main offices. Also underway: “a beautification plan for the schoolyard and a new drop-off area for students,” said Father Marino. That work is expected to start soon, to coincide with the 80th anniversary of the school in 2019. Located to the south of the church and housing the parish hall, St. Mary Cathedral School is an integral part of the parish. It was founded in 1939 and originally encompassed a high school. It was administered by the Sisters of St. Joseph of St. Augustine until 2007, when the Servants of the Pierced Hearts of Jesus and Mary took over. At the end of the 2017-18 academic year, the school named its first lay principal. The school now teaches children from PreK-3 through eighth grade, with about 400 currently enrolled. Msgr. Hogan also praised the work of the religious and laity who teach there, and whose love of the students leads them to sacrifice better-paying opportunities at other places. 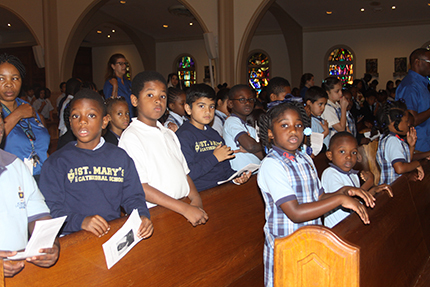 Students of St. Mary Cathedral School take part in the weekly school Mass. The school teaches children from PreK3 through eighth grade. Teresita Carbajal, the piano teacher, is a case in point. She worked at the school as the music and religion teacher from 1983 until her retirement in 2002. She is now a fulltime volunteer, filling in as a substitute teacher while also giving piano lessons after school and helping in the office. The pope knew of the presence of the Haitian community and wanted to say a few words in Creole. Organizers tapped a member of the choir to assist him with the pronunciation. They both entered one of the chapels, and “for a moment no one knew where the pope went,” said Msgr. Hogan. “The youths dressed in white to welcome him,” recalled Pierre, who was a involved in the youth ministry at the time. She also remembers participating in the ordination of the archdiocese’s first Haitian priest in 1988, Msgr. Jean Pierre, currently pastor of St. Maurice at Resurrection in Dania Beach. Click on this link for more photographs of St. Mary Cathedral. Es la Catedral de St. Mary muy especial para mi. Puesto que el 10 de Julio de 1971 George y yo recibimos el sacramento del Matrimonio en la Catedral. Siempre ha sido un lugar donde todos los feligreses se sienten como en su casa.